Load your site quicker than ever, thanks to decreased theme file sizes. If you are a current or past Graph Paper Press theme user, this is a highly recommended update. Graph Paper Press also went back to the design chopping block and has emerged much cleaner and now features links to a growing list of sites using our themes. We received a flood of emails after we released this feature and I’ve got to say that I’m totally and utterly impressed by how our sites are being used around the world wide internets. These sites are a testament to our WordPress theme design philosophy: We build themes that are highly flexible and minimally skinned so that you, the publisher, can have maximum creative control. 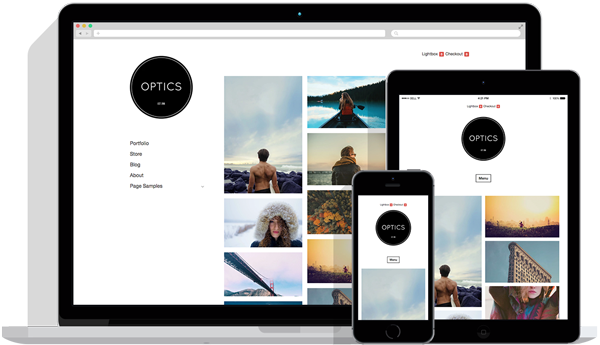 The people who use our themes are highly creative content producers, including photographers, videographers, designers, and publishers. The new Graph Paper Press site is a slightly modified version of Modularity. Here is the amazing part: The site redesign was completed in about eight hours total. Yep, eight hours. Designing with Modularity as a base theme makes theme development ridiculously simple because of the numerous homepage “apps” to choose from. These apps, paired with a CSS framework, gave me a great head start on reinventing this site. More changes are planned, so stay tuned. In theme news, we postponed the release of Fullscreen Pro so that we could update our existing set of themes. That said, Fullscreen Pro is going to be a real surprise and will include a feature set that is much, much more robust that initially planned. Fullscreen Pro is actually three themes crammed into one, with a set of homepage designs to select from on the theme options page. This will be very popular with the photo/visual crowd. And to keep up with the Jones’, we’re also now on Twitter. Imagine that! As you can see, I’m not a huge fan of the site, but it will give us another channel to communicate smallish news updates and snippets of goodness from around the Web. So follow us if you want. The next person to join our monthly newsletter gets a 25% off coupon! Thad is the founder of Theme.Works and Graph Paper Press. Previously, he produced online multimedia and documentary projects for USA Today including the inauguration of President Barack Obama and many others. He lives in Brooklyn, NY with his wife Abby. Thank you for opening this topic. © 2019 Graph Paper Press. All rights reserved.